To keep costs down, Steve Wozniak’s design of the Apple II’s graphics modes exploited the NTSC colour video standard in a novel way. However, the colour palette (purple and green or blue and orange) could only be changed every seven pixels (with the eighth bit in each video byte used to determine the palette). 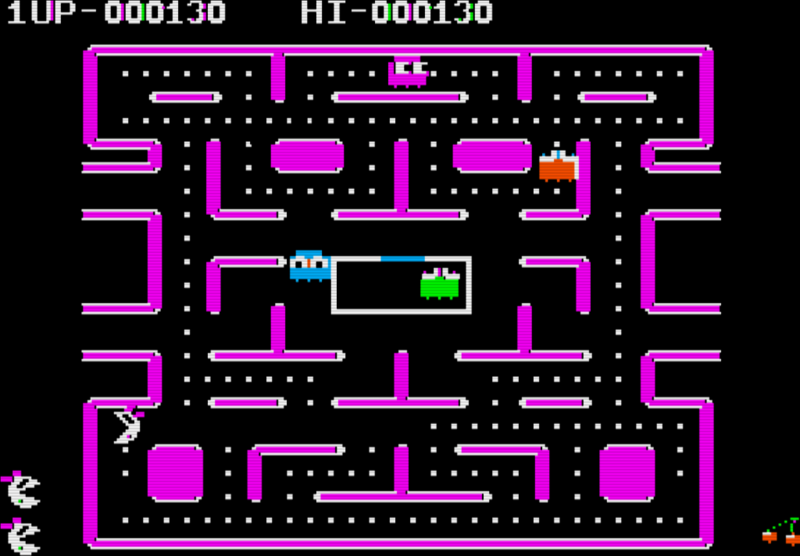 This made using all four non-monochrome colours on-screen at once a bit tricky, since one could inadvertently change the colour of adjacent pixels. Also, where two different “coloured” 2-bit (01, 10, etc.) 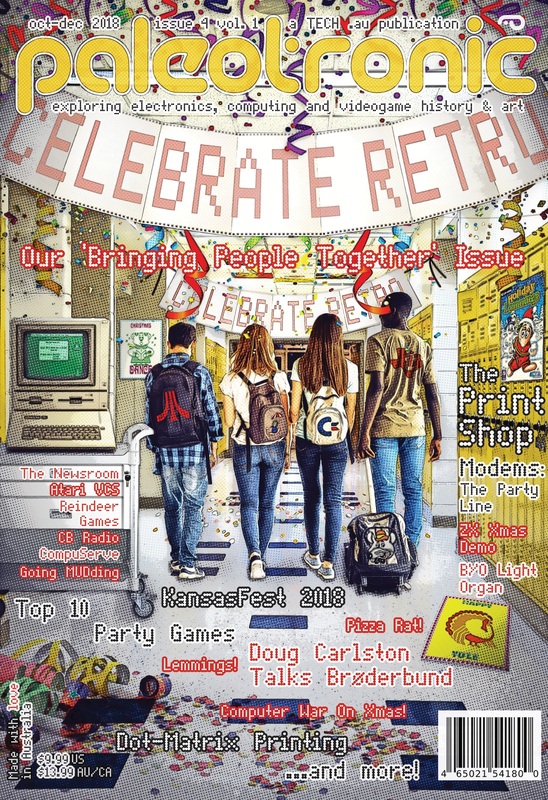 pixels sat side-by-side, you could get “fringing” or artefacting caused by the last bit of the first pixel and the first bit of the second pixel being interpreted by the monitor (or TV – or emulator) as its own different-coloured pixel! The various artefacts caused by unintentional bit patterns are apparent in this example, including fringing (top-left and bottom-right), “fat” pixels (top-right) and “colour clash” (bottom-left). 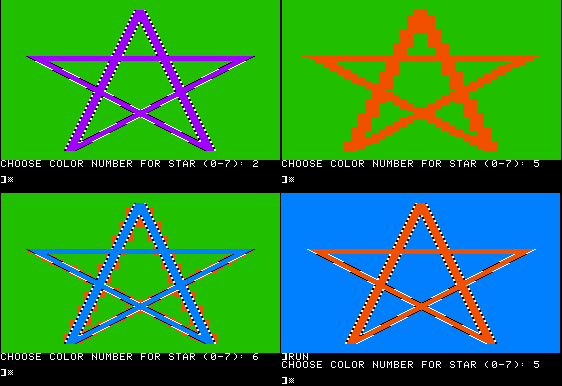 The colours generated in the Apple II’s “low resolution” (GR) mode are generated in a similar way, however instead of two-bit patterns it uses four-bit patterns corresponding to 16 colours. These patterns are stored in the memory used for the text screen, with each of 256 8-bit “characters” representing two same or different colour 4-bit pixels, stacked on top of each other, and resulting in a 40×48 pixel display. If you switch from GR mode to text, you can see the various characters that represent each pixel. As a result of this technique, on monochrome monitors both low and high-resolution colours are displayed as patterns, usually creating a representation of the colour screen practical enough to be interpreted by the user. Indeed, some applications, such as Apple II Desktop, are actually meant to be used in monochrome, and look terrible in colour! 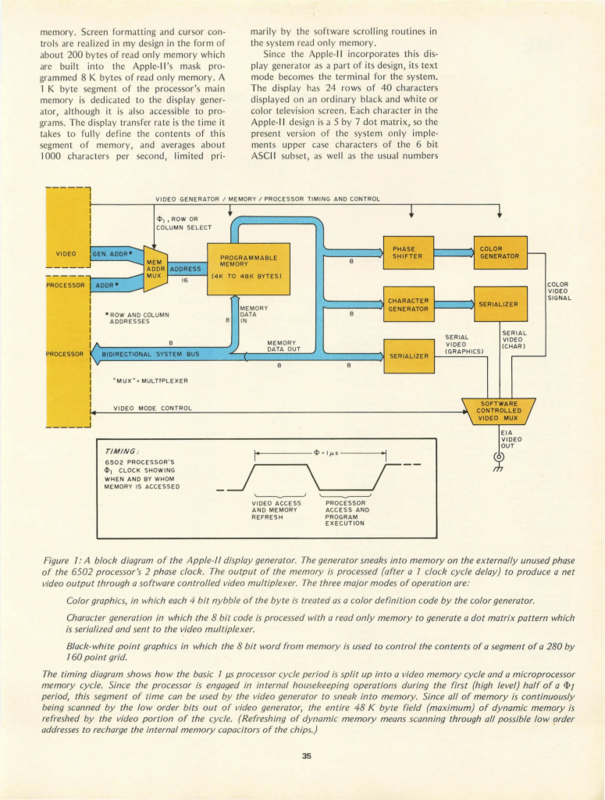 The diagram above shows the components of the Apple II as they relate to its video sub-system. “Soft switches” toggle on and off various video components, which when active read appropriate memory areas to generate their respective video signals, which are muxed. 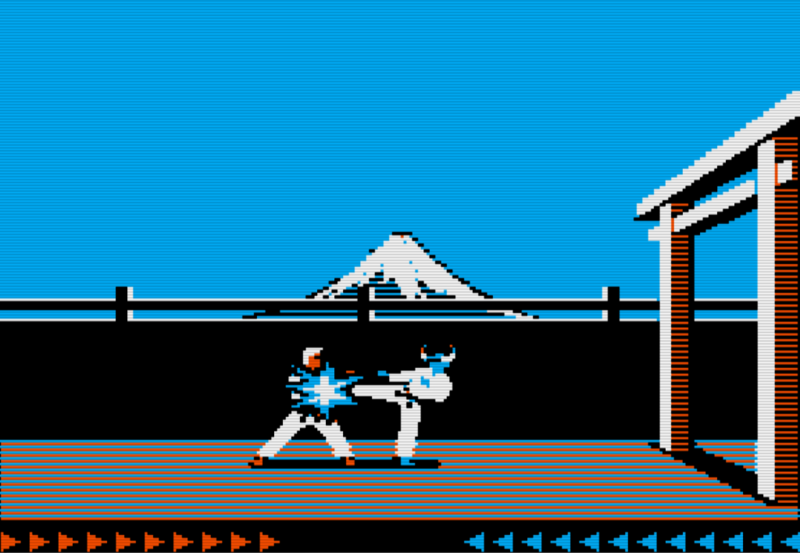 Jordan Mechner’s Karateka, above, uses the second bank of four HGR colours (black, blue, orange and white) while Atarisoft’s Ms. Pacman (below) uses both banks (black, purple, green, blue, orange and white.) Games could use one bank, the other, or both. After Steve Wozniak attended a meeting of the Homebrew Computer Club, a group of Silicon Valley computer hobbyists, in 1975, he was inspired to create his own computer. Others were interested in his design, and his friend Steve Jobs thought it would be a good idea to manufacture a run of circuit boards, to make it easier for members of the club to build their own “Woz machine”. Pre-sales weren’t a thing in 1975 and so Wozniak sold his HP calculator and Jobs his VW microbus to fund the venture. Jobs managed to sell around 50 pre-built Apple computers (“Byte into an Apple”) to a local computer store (coincidentally, the Byte Shop). They went on sale in mid-1976, and sold until mid-1977. Meanwhile, Wozniak continued to build on the Apple, refining it as a consumer product and adding high-resolution graphics while working to reduce the complexity (and therefore cost) in as many ways possible. Jobs commissioned a former HP designer to create a case for the upgraded computer. In June of 1977 the computer, christened the Apple II, was made available for sale to the public. The rest is history.